Your favorite characters from The LEGO Batman Movie as LEGO mini-figures! There are 20 different characters to collect. Display box includes 60 individually blind-packaged figures. Are you ready for a fun surprise? These exciting LEGO Mini-figures come randomly packaged, just like trading cards! Each Mini-figure comes in a sealed mystery bag, so you never know which Mini-figure you might get. Every character has its own special accessories, display stand, and collector's leaflet. Collect them all, and use their parts to customize your very own figures! With 20 special Mini-figures in The LEGO Batman Movie Series 2, the LEGO Mini-figure Collection continues to grow. This collection includes: Swimsuit Batman, Vacation Robin, Vacation The Joker, Disco Harley Quinn, Vacation Alfred Pennyworth, Vacation Batgirl, Doctor Phosphorus, Clock King, Mermaid Batman, Killer Moth, Jor-El, General Zod, Apache Chief, Bat-Merch Batgirl, Hugo Strange, Disco Alfred Pennyworth, Black Canary, Black Vulcan, Wonder Twin Zan, and Wonder Twin Jayna. Piece count varies by figure. 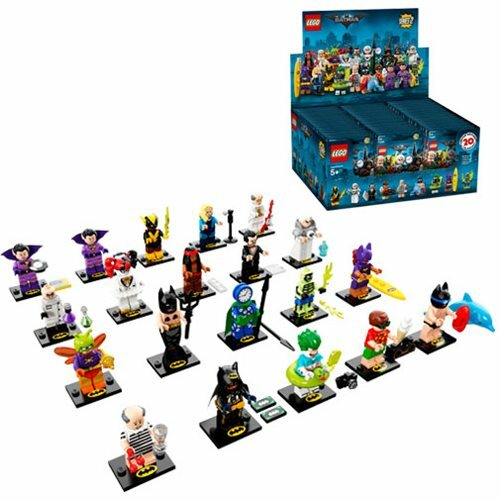 Item LEGO 71020 The LEGO Batman Movie Mini-Figure Series 2 Display Box 60 Figures gets you 60 individually packaged, randomly selected figures in a display box, suitable for collecting and trading. Collect all 20 Mini-figures! Ages 5 and up.